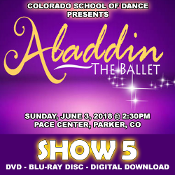 Veria Video In Association With The Colorado School of Dance in Parker, CO presents the Aladdin Ballet (Cast B) on DVD & Blu-ray Disc as performed on Sunday, June 3, 2018 at 2:30 p.m. Estimated time of completion / delivery is 6 - 8 weeks after filming of event. Digital Copy HD downloads will also be made available for an additional $5! NEW THIS YEAR! Expedite service now available! Veria Video is now pleased to offer a priority processing / expedite service! For an additional $40 (per dance), you will receive an online link to view / download your child's dance performance within 3 - 7 days after the show or after we receive your order! Please include the DANCE NAME (as listed in the CSD recital program) using the text field when clicking the expedite checkbox below.